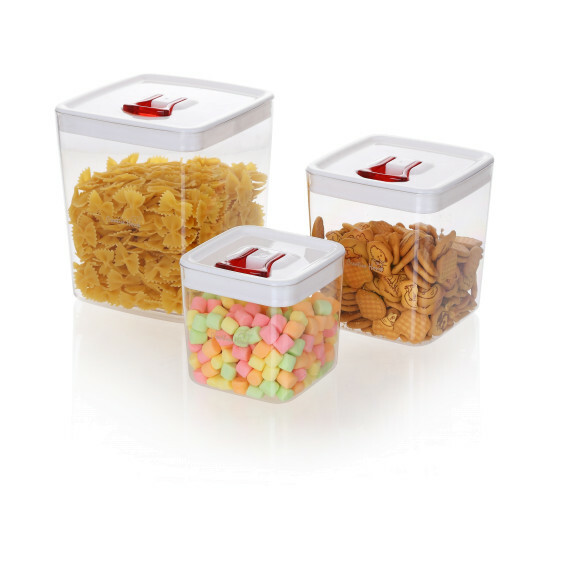 Designed for ease of use and storage, these plastic storage containers are conveniently sized that make sealing, storing, and dispensing a breeze. The 3-piece set is excellent for pantry staples like grains, flour, baking mixes, cereal, coffee, granola, cookies, sugar, beans, rice, dried fruits, candy, noodles, pasta, and more. The sturdy, clear plastic BPA-free construction of these food containers let you see inside and their square-shaped design and rounded corners make easy holding and pouring. Not only these plastic containers are just for kitchen and pantries, you can use them anywhere in the house where organization is needed: bathrooms, garage, sewing room, home office, craft room, or play room. These clear storage canisters have innovative lids which airtight seals that maintain food fresher longer. Enjoy easy organization and take advantage of every cubic inch of your kitchen space. Click ‘add to cart’ button above and order these food storage containers canister 3 set today!